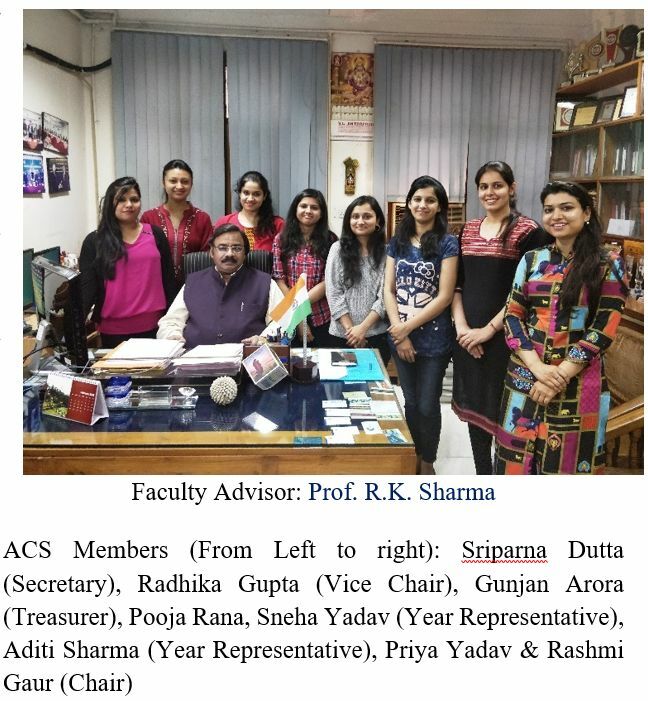 The ACS International Student Chapter at the University of Delhi in India has been actively involved in organizing several national and international conferences and workshops. Spreading the importance of and knowledge about green chemistry is the major and continued focus of the group. 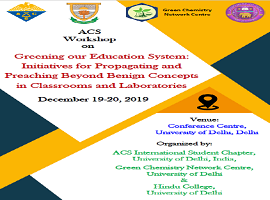 The activities and events planned by the chapter are aimed at bringing information to others about green chemistry and encouraging those in the academic world to adopt it into their lectures, laboratories and research. 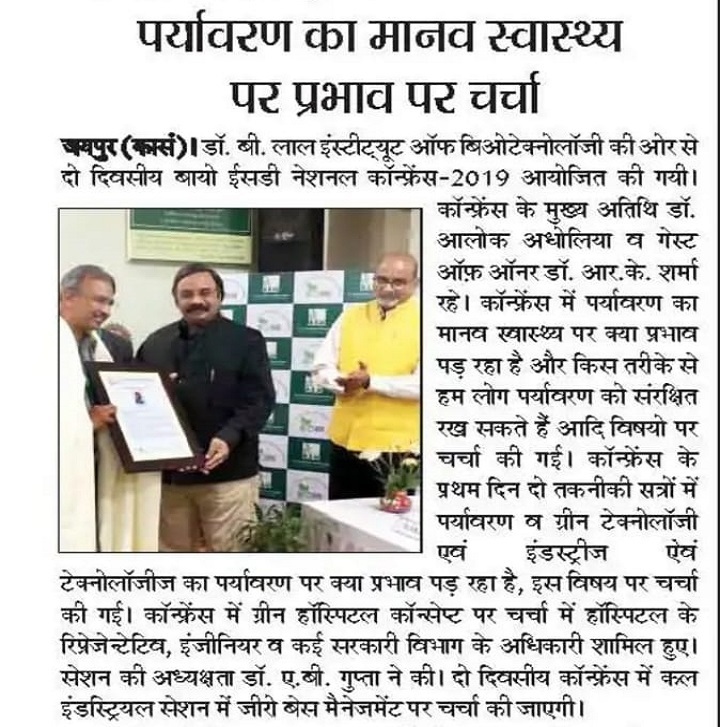 It is the sincere efforts of Prof. R. K. Sharma, our Student Chapter Faculty Advisor and Coordinator of the Green Chemistry Network Centre at the University of Delhi, which play an indispensable role in popularizing green chemistry through the organization of numerous chapter activities. 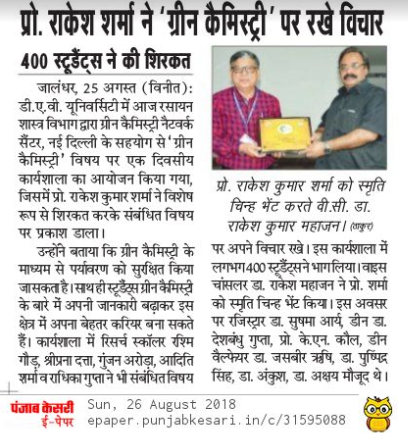 Recently, the chapter has organized an International Conference on “Advancing Green Chemistry: Building a Sustainable Tomorrow” that aimed at initiating conversations on deep environmental issues by creating an interdisciplinary platform to share new information, advances and outlook in green chemistry to answer current and future prospects. 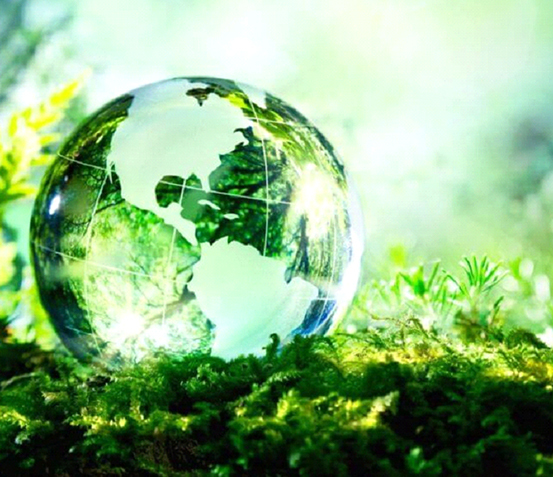 The conference covered the crucial problems of our planet--the speakers in the conference presented the latest green initiatives in energy, environment and health based on their own experiences in either industry or academia to address the challenges and opportunities in green chemistry. 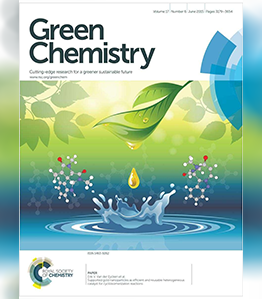 They provided strategies for designing, adapting and incorporating new green techniques in industries as well as in academia. The Conference promoted and developed the chemical sciences for the benefit of society and cost-effective solutions that can be implemented by local leaders and replicated in other areas of the world facing similar circumstances. 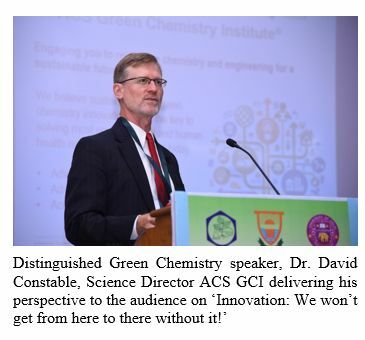 Dr. David Constable, Science Director, ACS Green Chemistry Institute, participated and shared his views in the conference. 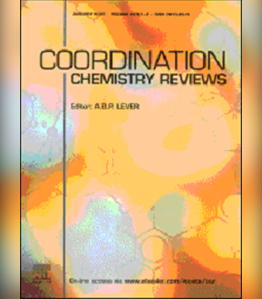 The chapter also believes that the concepts, strategies and practices of green chemistry can be best implemented by administering green chemistry courses in the curriculum. 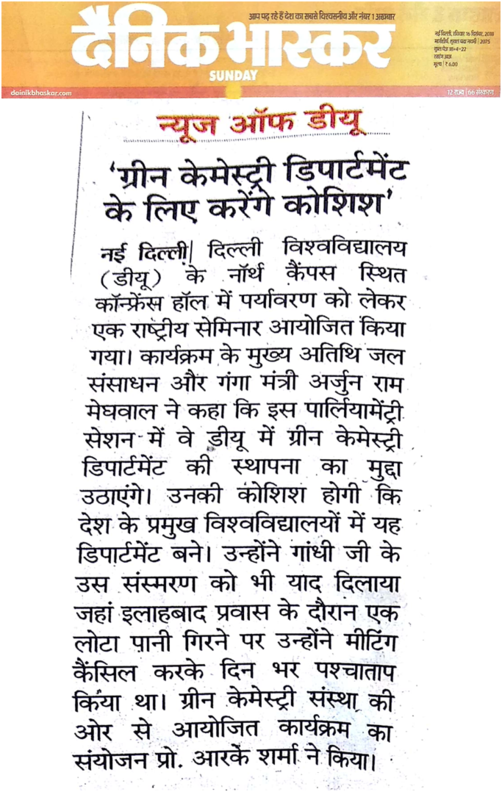 For this, a special workshop was organized by the chapter in which a large number of students and teachers from various colleges of University of Delhi participated with great enthusiasm. Through their interaction regarding teaching courses in Green Chemistry namely a skill enhancement course entitled “Green Methods in Chemistry” and also a discipline selective elective in Green Chemistry”, participants learnt about the new developments in this area and steps to further improve the way we perform our experiments so as to make chemistry labs safer and healthy for students. 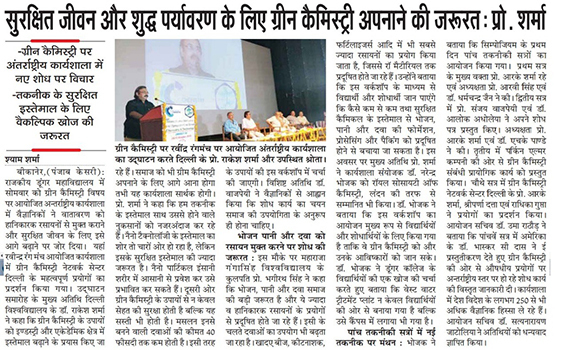 These improvements will spark creative seeds in the minds of young students and thus they will be motivated to opt for chemistry as a discipline. 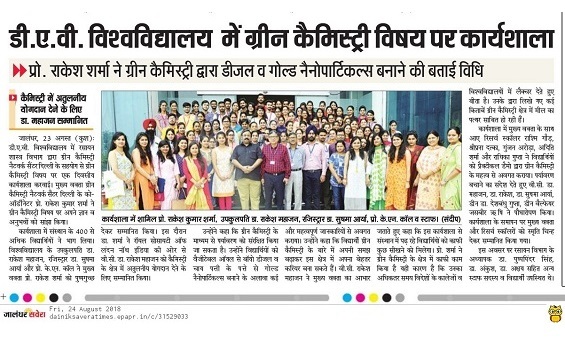 Considering the importance of hands-on laboratory science, the chapter also organized an event in which the undergraduate students were given an opportunity to perform various green chemistry experiments. 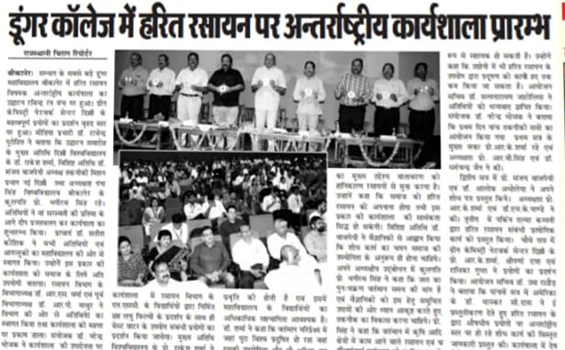 The event provided a platform to the students to broaden their outlook towards the recent trends in the field. 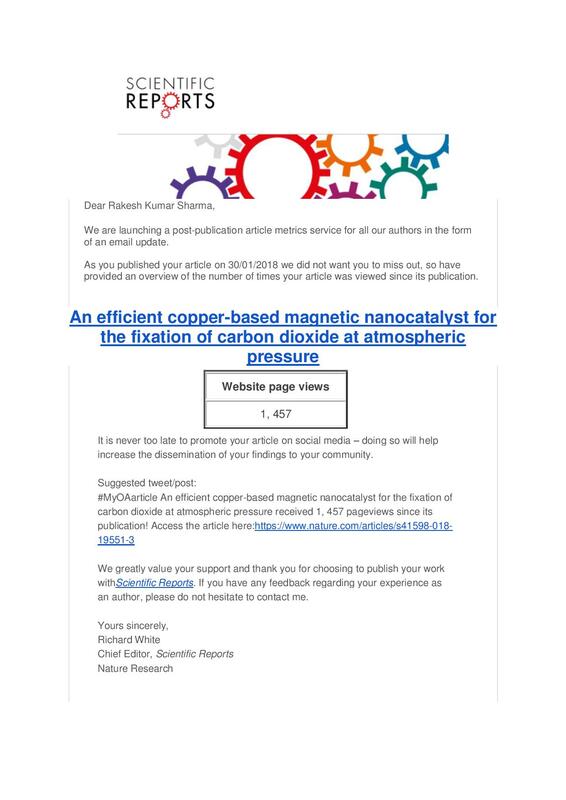 The chapter also supports its members to get involved with numerous scientific societies across the world and to share diverse ideas with students, teachers and researchers. 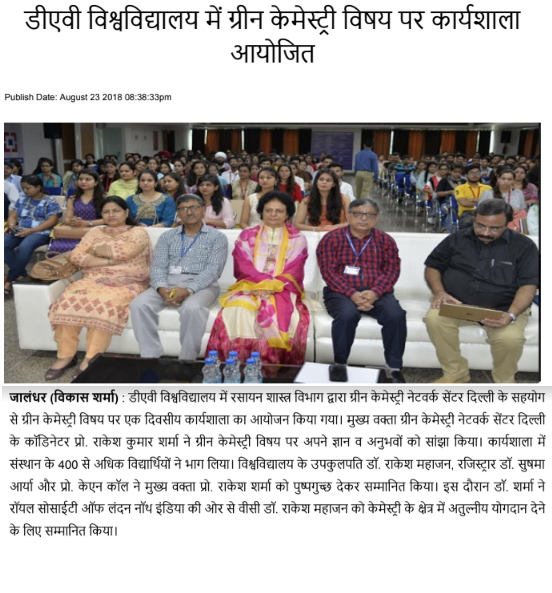 We are highly indebted to ACS as it always provides numerous meaningful opportunities for the development of young chemical scientists through its scientific or career themed outreach programs such as ACS National Meetings. 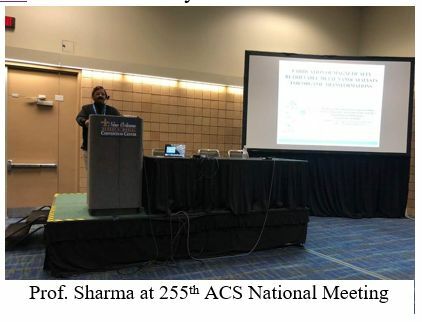 We were extremely fortunate to be awarded with 255th ACS National Meeting Travel Grant with which our faculty advisor Prof. R. K. Sharma, along with the Secretary of the chapter, Sriparna Dutta, gained cross-cultural experiences and learnt more about the society and its resources by attending the meeting at New Orleans. 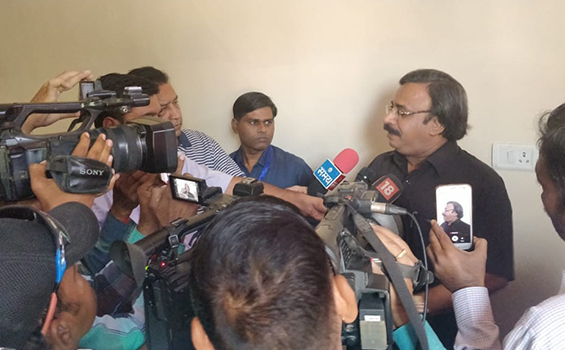 Prof. Sharma also delivered his talk on “Fabrication of magnetically retrievable metal nanocatalysts for organic transformations,” which was highly appreciated by all the attendees. Our chapter also keeps on participating in various international conferences being organized by the American Chemical Society. 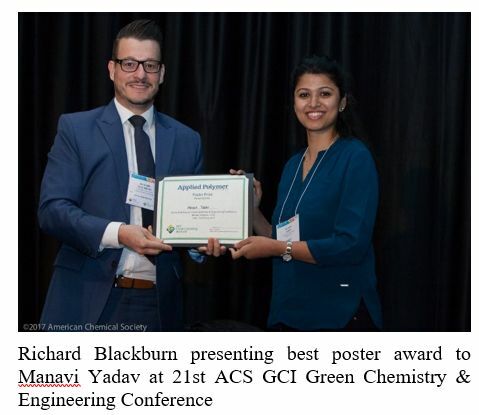 Prof. Sharma and his research scholar Dr. Manavi Yadav (Former President of ACS Student Chapter) participated in 21st Annual Green Chemistry & Engineering Conference on June 15, 2017 at Reston, VA, USA. 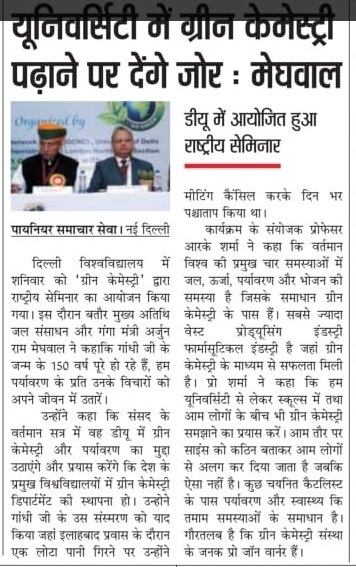 The GC&E conference has been long recognized as world's best and one of the most important meetings in the field of green chemistry and engineering. It routinely attracts the world’s top scientific researchers, along with government and industry leaders. Our research work was recognized by American Chemical Society in the form of first prize in best student poster at the conference. Our chapter is making a lot of efforts to motivate the younger generation towards sustainable development and green chemistry. 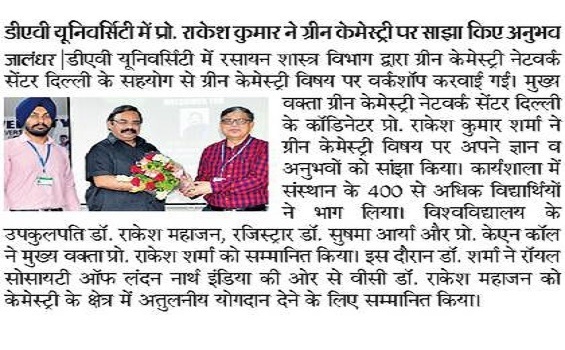 In this direction, we are also planning to organize a conference for young researchers and students in collaboration with ACS Green Chemistry Institute. 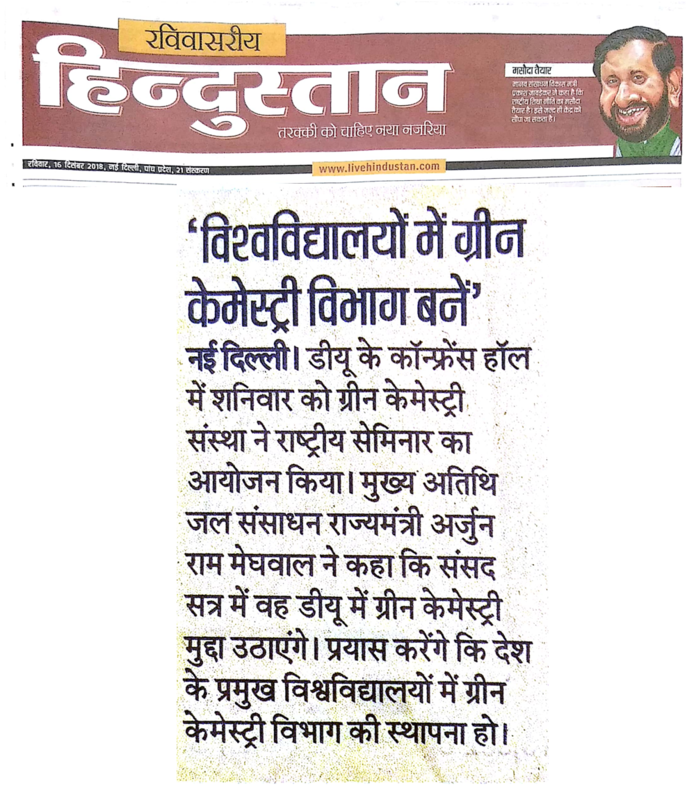 Prof. Sharma believes that the bright future of green chemistry lies in the hands of budding researchers. 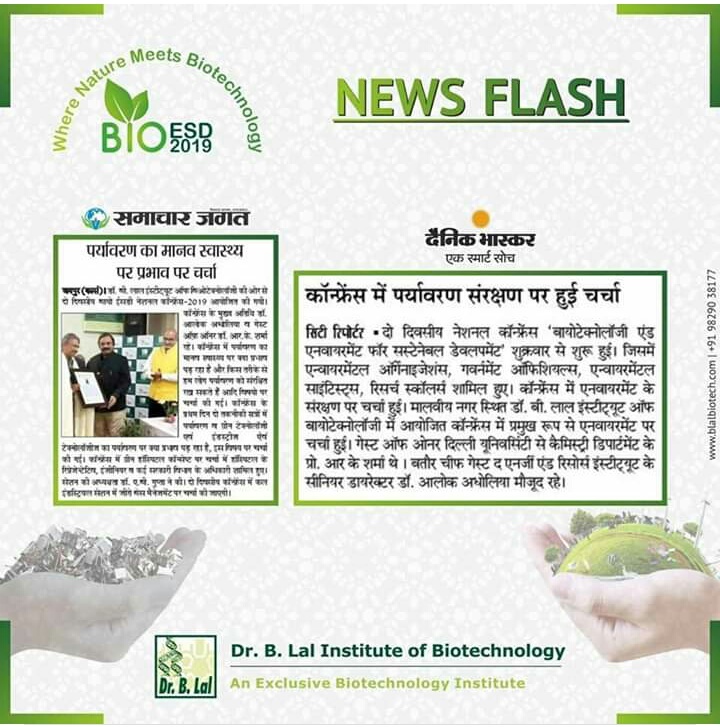 He often says, “the day when every individual become vigilant to incorporate green chemistry in daily practices, my dream of making the planet a better place to live in will come true!”. 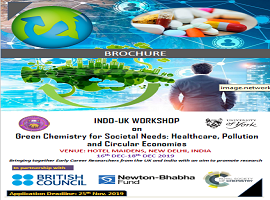 Green Chemistry Network Centre was established under the recommendation of World Leaders in Green Chemistry headed by Professor Paul Anastas (known as father of Green Chemistry). 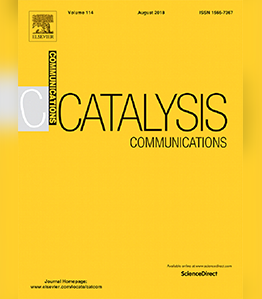 Silica-nanosphere-based organic-inorganic hybrid nanomaterials: synthesis, functionalization and applications in catalysis. 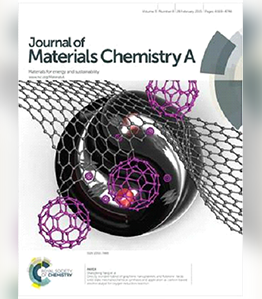 Silica-decorated magnetic nanocomposites for catalytic applications. Zirconium(IV)-modified silica gel: Preparation, characterization and catalytic activity in the synthesis of some biologically important molecules.